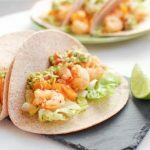 Slightly sweet and full of spice, these Spicy Shrimp Tacos are a perfect for a quick, easy weeknight dinner. Just popping in to share a quick recipe with you today! I mentioned in yesterday’s Weekly Eats post that meals have definitely gotten a little crazier since Squish was born. Trying to find enough time for both hubby and I to workout after work, plus make time to hang out as a family means dinners need to be quick and easy. These Spicy Shrimp Tacos fit the bill. The shrimp cook very quickly and taco shells are the perfect vehicle for shrimp + all your favorite toppings! These are actually a spin on one of my go-to meals – Sweet and Spicy Shrimp with Soba Noodles – the recipe is fairly similar but eating them in taco form makes it a completely different meal! 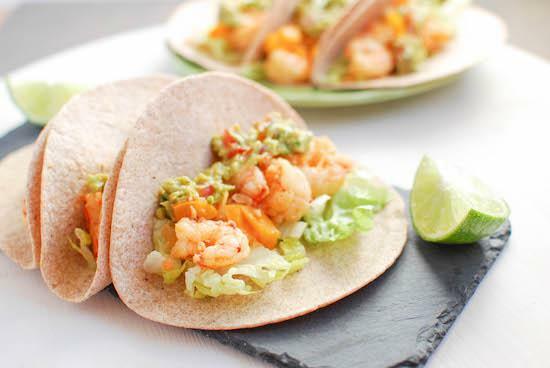 Slightly sweet and full of spice, these Spicy Shrimp Tacos make a quick and easy weeknight meal! Saute garlic, onions, peppers and lime juice for 5 minutes. Add shrimp, spices and thai chili sauce and cook another 5 minutes. Drain excess liquid if necessary. For some reason I just can’t get enough of the thai chili sauce + seafood combo. I especially love it on shrimp and salmon. I’m usually lazy and buy mine at the store but it had been on my list of things to try making at home. Lucky for me, my friend Kristina recently posted a recipe for Homemade Thai Chili Sauce so feel free to make your own! Sounds so simple! Back to the tacos….in my opinion the guac is not optional…and I forgot to add feta to mine but it would have been delish! Sweet, spicy and ready in 15 minutes! 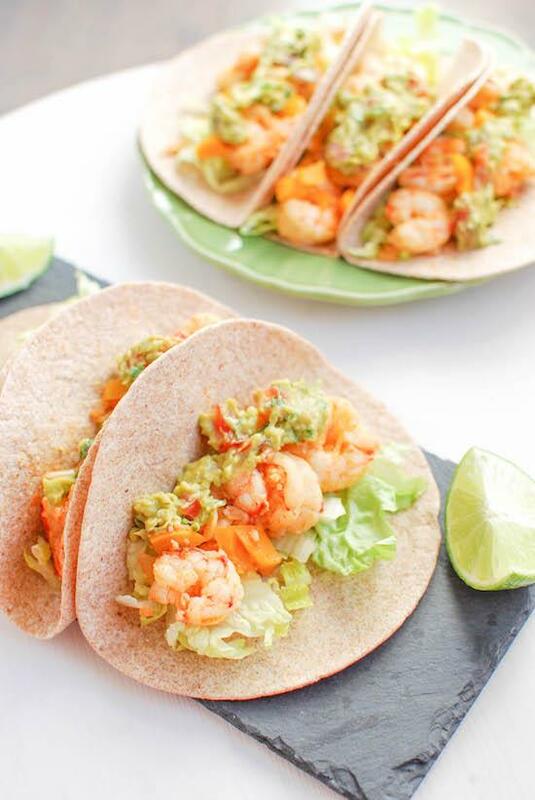 Spicy Shrimp Tacos from @Leangrnbeanblog! And now we will have to have tacos for dinner tonight. Looks delicious! Curious – do you both still eat together? I want to make that a goal to still try to do family dinners but with our stage of life right now, fitting in practicing my group fitness teaching, him working late, boys bed times etc….I find our dinners are never together! And for me and my disordered eating past I want to make ‘normal’ family dinners a routine! I have been craving shrimp lately myself. I like any and all spicy foods so this is right up my ally! Yum! I was just pinning fish tacos last night thinking I need to make some. These look delicious! Looooove this! Spicy shrimp – I’m drooling! I’ll definitely have to have these for taco tuesday next week! can’t ever go wrong with any type of tacos, in my opinion! Yummmm–these do look like the perfect weeknight meal! Oh Lindsay! I was looking for something to make on Friday! Lent is an interesting time for me to try to make food for kids. Think I’ll give these a whirl. shrimp tacos are one of my favorite meals. i usually put purple cabbage on them, but then always have so much leftover and it feels wasteful. i like this alternative. Everything tastes better as a taco. Any food my family and I can pick up with our hands is a winner in our book. You’re right, guac is definitely NOT optional. I can imagine you having way less time to cook now that you have the little one to take care of too. Love that tacos are usually ready in a jiffy! Shrimp tacos are my ABSOLUTE FAVORITE! I don’t make many thing with shrimp, but it would definitely be a good way to mix up dinner. Shrimp are so easy to use in meals too, so thanks for sharing! YUM! And ready in just 15 minutes? Sounds perfect in every way! There’s nothing like a good shrimp taco. I’ve been way more into spicy foods recently and these look perfect! YUM. Love that I could probably throw this together when I get home from work- thank you! I totally agree on the guac not being optional. I love shrimp tacos and that sweet thai chili sauce sounds so good with it! I have such a hard time cooking shrimp, they always end up like weird little fishy tasting gummy bears. I have less of a hard time with fish though, do you suppose it would be just as good with halibut? Yep! Fish tacos are a great choice! [WORDPRESS HASHCASH] The comment’s server IP (23.239.19.156) doesn’t match the comment’s URL host IP (104.28.12.48) and so is spam. [WORDPRESS HASHCASH] The comment’s server IP (66.96.183.1) doesn’t match the comment’s URL host IP (66.96.147.104) and so is spam.